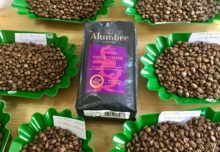 Alumbre Coffee > PRESS > Coffee Events > Alumbre Launch Release! Named for the river that flows west facing the hills of the Tarrazu region of Costa Rica, Alumbre is long revered as the home of the finest coffee farms in the world. Here, the river flows in the direction of excellence, nurturing the prized estate of Hacienda La Minita. La Minita Tarrazu® the most prized coffee, hailing from the legendary flagship estate in the Tarrazu region of Costa Rica. The unique combination of the optimum climate, elevation, and soil contributes to its unparalleled quality. This single origin medium roast presents sweet flavors of orange and caramelized sugar. Alma Del Café De Jardin® is a single origin medium roast from Colombia. The rich volcanic soil and unique microclimates in the Antioquia region provide excellent growing conditions that result in a rich and sweet coffee with flavors of chocolate, caramel, and hints of tropical fruit. Yirgacheffe is a single origin medium roast from the Sidamo region of Ethiopia. The most discriminating coffee buyers in the world seek out this coffee with fruity notes, a floral aroma, and playful hints of lemon and berries. Mutu Batak™ is a single origin dark roast from the Lintong region of Sumatra. This coffee is completely wet hulled, sun-dried and triple-picked, creating layers of citrus and pipe tobacco notes with floral and sandalwood aromas. French Roast is a premium full-bodied blend of our finest Latin American beans, roasted to perfection to create this bold and intense dark roast with distinctly smoky overtones. Made with 100% Arabica beans, the pride of Alumbre is reflected in the modern and artful package design, inspired by the river and heritage terrain where the coffee originates. The four single-origin coffees will be available in 12 oz. bags of whole beans, and the French Roast blend in a 10 oz. bag of whole beans. 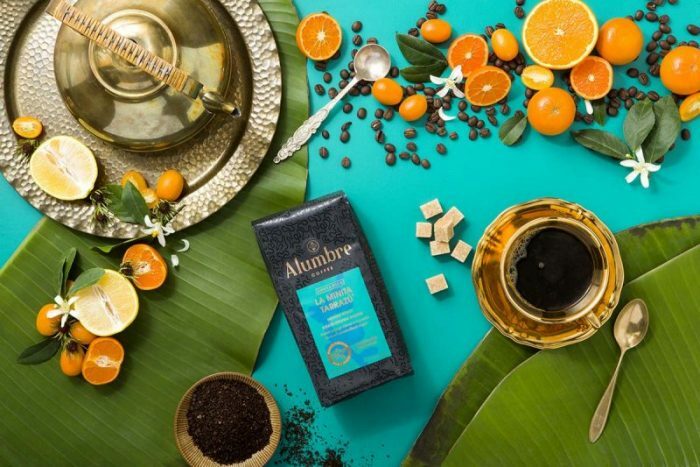 Alumbre is Java Trading Company’s first line of branded coffee, committed to sustainable farming, milling, sourcing, and roasting. What makes Alumbre exceptional is the coffee journey from seed to cup. The company practices stewardship of both its employees and land. Farm and mill workers and their families receive high wages, have access to long-term savings accounts, and are offered free modern housing and school supplies. The company also uses biomass furnaces and clean, renewable hydropower, generating green electricity throughout the year. Alumbre Coffee™, a Java Trading Company brand, is a coffee line nurtured from seed to cup. Building on nearly 50 years of experience, we start by selecting coffees from the finest producing regions of the world, and we work only with producers who share our values and understand our passion for quality. We believe every cup of Alumbre coffee represents these two things: the special nature of the places where great coffees thrive, and the people who have dedicated their lives to producing them. We are continuously investing in our people, who play an integral part in the production of our coffees, through special projects and initiatives to ensure their livelihood and well-being. Our commitment to the environment and our people has paved the path for an industry-wide standard of sustainable coffee production.